A key characteristic of Keranat™ is its content in miliacin, a natural compound that has been investigated extensively in recent years. Present in millet (Panicum miliaceum), this triterpenoid has revealed a number of beneficial effects for hair health and growth. Clinical studies have shown this natural active principle accelerates cell division in the hair bulb, strengthening and encouraging growth of the hair. Keranat™ also contains ceramides, a form of lipid known as ‘polar’ lipids. These fulfil essential functions within the structure of the skin including that of the scalp, such as helping in the cohesion of epidermal cells and in hydrating the skin. In this context, clinical studies have confirmed the benefits of supplementing with ceramides for reducing dryness, flakiness and itching of the skin. As well as improving the health of the scalp, ceramides have also been shown to benefit the hair. Indeed, these lipids are also found in the hair cuticle, the outermost protective part of the hair shaft. Thus ceramides play a role in the structure and protection of the hair. 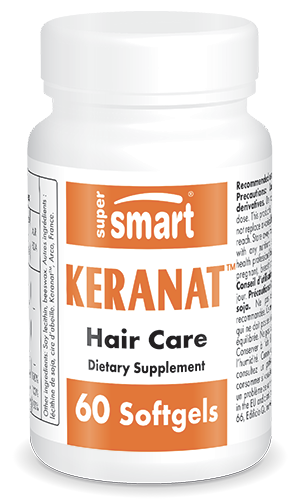 Combining the benefits of miliacin and ceramides, Keranat™ is a proven treatment for hair loss. Clinical studies show that it slowed down hair loss by up to 50% after just three months’ use, and also generated hair regrowth. This supplement thus offers significant therapeutic benefits for treating alopecia and baldness.